Neural networks (NN), also called artificial neural networks (ANN) are a subset of learning algorithms within the machine learning field that are loosely based on the concept of biological neural networks. A deliberate activation function for every hidden layer. In this simple neural network Python tutorial, we’ll employ the Sigmoid activation function. There are several types of neural networks. In this project, we are going to create the feed-forward or perception neural networks. This type of ANN relays data directly from the front to the back. Training the feed-forward neurons often need back-propagation, which provides the network with corresponding set of inputs and outputs. When the input data is transmitted into the neuron, it is processed, and an output is generated. And, the best way to understand how neural networks work is to learn how to build one from scratch (without using any library). In this article, we’ll demonstrate how to use the Python programming language to create a simple neural network. Here is a table that shows the problem. New Situation 1 0 0 ? We are going to train the neural network such that it can predict the correct output value when provided with a new set of data. As you can see on the table, the value of the output is always equal to the first value in the input section. Therefore, we expect the value of the output (?) to be 1. Let’s see if we can use some Python code to give the same result (You can peruse the code for this project at the end of this article before continuing with the reading). We’ll create a NeuralNetwork class in Python to train the neuron to give an accurate prediction. The class will also have other helper functions. Even though we’ll not use a neural network library for this simple neural network example, we’ll import the numpy library to assist with the calculations. random—for generating random numbers. Note that we’ll seed the random numbers to ensure their efficient distribution. 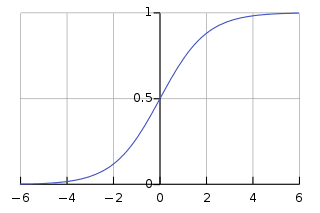 We’ll use the Sigmoid function, which draws a characteristic “S”-shaped curve, as an activation function to the neural network. This function can map any value to a value from 0 to 1. It will assist us to normalize the weighted sum of the inputs. Thereafter, we’ll create the derivative of the Sigmoid function to help in computing the essential adjustments to the weights. The output of a Sigmoid function can be employed to generate its derivative. For example, if the output variable is “x”, then its derivative will be x * (1-x). This is the stage where we’ll teach the neural network to make an accurate prediction. Every input will have a weight—either positive or negative. This implies that an input having a big number of positive weight or a big number of negative weight will influence the resulting output more. Remember that we initially began by allocating every weight to a random number. 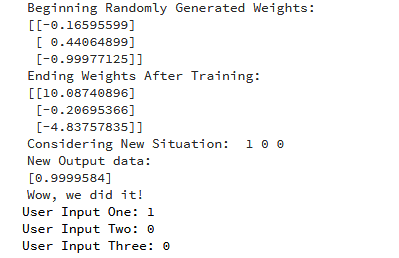 We took the inputs from the training dataset, performed some adjustments based on their weights, and siphoned them via a method that computed the output of the ANN. We computed the back-propagated error rate. In this case, it is the difference between neuron’s predicted output and the expected output of the training dataset. Based on the extent of the error got, we performed some minor weight adjustments using the Error Weighted Derivative formula. We iterated this process an arbitrary number of 15,000 times. In every iteration, the whole training set is processed simultaneously. Ultimately, the weights of the neuron will be optimized for the provided training data. Consequently, if the neuron is made to think about a new situation, which is the same as the previous one, it could make an accurate prediction. This is how back-propagation takes place. Finally, we initialized the NeuralNetwork class and ran the code. We managed to create a simple neural network. The neuron began by allocating itself some random weights. Thereafter, it trained itself using the training examples. Consequently, if it was presented with a new situation [1,0,0], it gave the value of 0.9999584. You remember that the correct answer we wanted was 1? Then, that’s very close—considering that the Sigmoid function outputs values between 0 and 1. Of course, we only used one neuron network to carry out the simple task. What if we connected several thousands of these artificial neural networks together? Could we possibly mimic how the human mind works 100%? Bio: Dr. Michael J. Garbade is the founder and CEO of Los Angeles-based blockchain education company LiveEdu . It’s the world’s leading platform that equips people with practical skills on creating complete products in future technological fields, including machine learning.